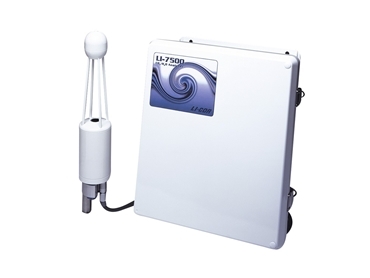 The LI-COR LI-7500 high speed, high precision, open path CO2/H20 infrared gas analyser, available from John Morris Scientific , measures absolute densities of carbon dioxide and water vapour in turbulent air. In the eddy covariance method, these measurements are used in conjunction with sonic anemometer data to determine fluxes of CO2 and H2O from natural or agricultural landscapes such as forests, grasslands, deserts and oceans for global change and ecological studies. The LI-7500 CO2/H20 infrared gas analyser features a sealed sensor head with sapphire optical windows, allowing operation in temperatures ranging from -250C to +50 degrees celcius and the light weight sensor head that can be mounted in any orientation. The open path analyser eliminates the need for a pump, reducing the overall power requirement of the flux system, as well as eliminating time delays, pressure drops and sorption/desorption of water vapour on tubing employed with closed path analysers. The LI-7500 CO2/H20 infrared gas analyser has simple Windows interface software which provides easy setup, calibration and monitoring for the user. The software also has a user programmable delay time feature to synchronize CO2 and H2O with data from sonic anemometers.